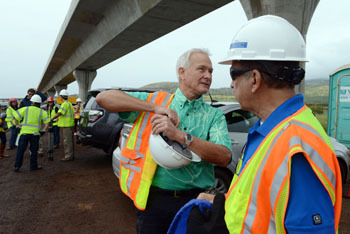 CODE BLUE: Why is the Hawaii GOP NOT FIGHTING the Giant New Rail Tax? 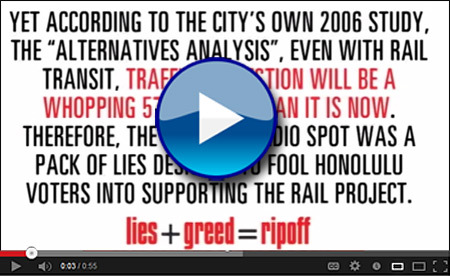 the Giant New Rail Tax? on every single purchase you make so that special interest groups loyal to the overspending Democrat machine will get their hands on hundreds of millions of dollars MORE of your hard-earned money. We know this gaffe is hundreds of millions of dollars over budget. S o you wonder, "Hey, why aren't state and local Republicans fighting this massive tax increase? Why aren't elected Republicans led by new minority leader Beth Fukumoto organizing the opposition to this disgusting money grab?" Here's the reality which we all must face. 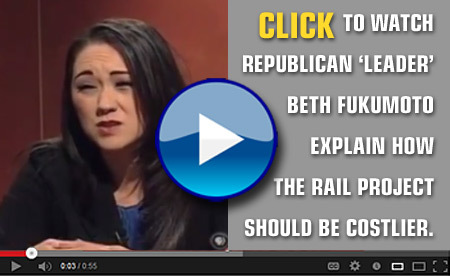 Faux Republican Beth Fukumoto, who is currently the leader of all Republicans at the State House, is a big time rail supporter who also doesn't mind higher taxes. 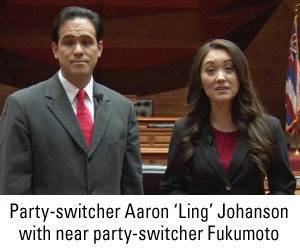 In fact, Fukumoto refuses to sign the pledge NOT to raise taxes, and she is our Republican leader?!?! You deserve the truth. 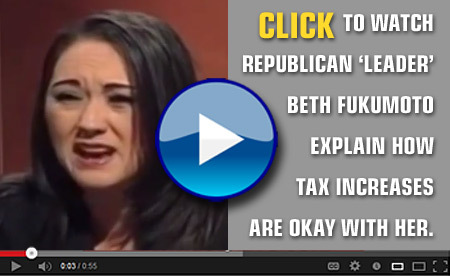 Here's Republican State House Caucus Leader Beth Fukumoto, the person who almost switched parties, telling us in her own words how she feels about taxes . . . and about rail. So if you've been wondering WHY Republicans under Beth Fukumoto REFUSE to lead the opposition to kill the GIANT tax increase championed by Democrats but OPPOSED by voters and taxpayers, then NOW you know why. Simply put, our party has been hijacked by liberals who embrace the Democrat agenda while merely giving lip service to 'fiscal conservatism' in order to FOOL rank and file Republicans. 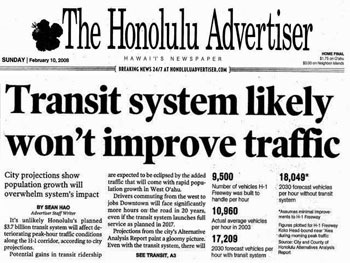 , and it's because we know that the Rail Scam barely passed in 2008 only after the big lie was repeated thousands of times to fool taxpayers into believing rail would help traffic congestion when the liberal politicians and the special interest groups KNEW that traffic congestion WITH RAIL would not be reduced but actually WORSENED by 57% -- resulting in complete gridlock rather than the promised relief. In case you forgot, here's the lie . . .
Punishingly high taxes and severely wasteful spending are allowed to become law without even a whimper from our top Republicans. WHY don't our party leaders want to fight wasteful spending and WHY won't they fight higher taxes? Why are so many other bad bills being ignored? At HIRA, we want our party to be viable, meaningful, and fearless in the face of the dictatorial power of Democrats. 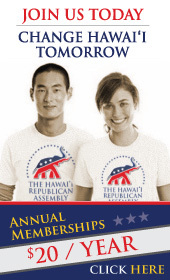 You deserve better, and the Hawaii Republican Assembly is FEARLESS in actively promoting conservative solutions in the 50th state. Please join HIRA today. Annual memberships in HIRA are just $20. Lifetime memberships are $250. And your generous donations are always welcome. EVERY PENNY gets put to use rescuing our party and taking the fight to the Democrats. MAHALO!